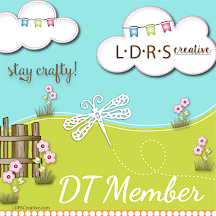 Creativity Within : Hero Arts Summer Catalog Blog Hop and Giveaway! Happy Tuesday! 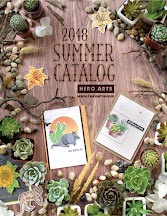 And welcome to Hero Arts Summer Catalog Release blog hop. Hope you are following the blog hop, and if not please go back to the Hero Arts blog to start from the beginning! 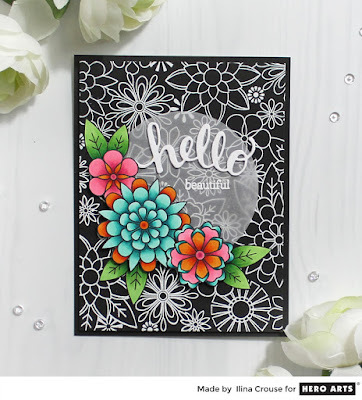 Now, you have probably arrived here from Emily Midgett's blog and if you haven't trust me you don't want to miss her amazing projects. So go back to her blog or start from the beginning(the Hero Arts blog) and if you arrived here from her blog, then you are on the right track and your next stop will be Janette Kausen blog(and you don't want to miss her project, either). I have few cards today. 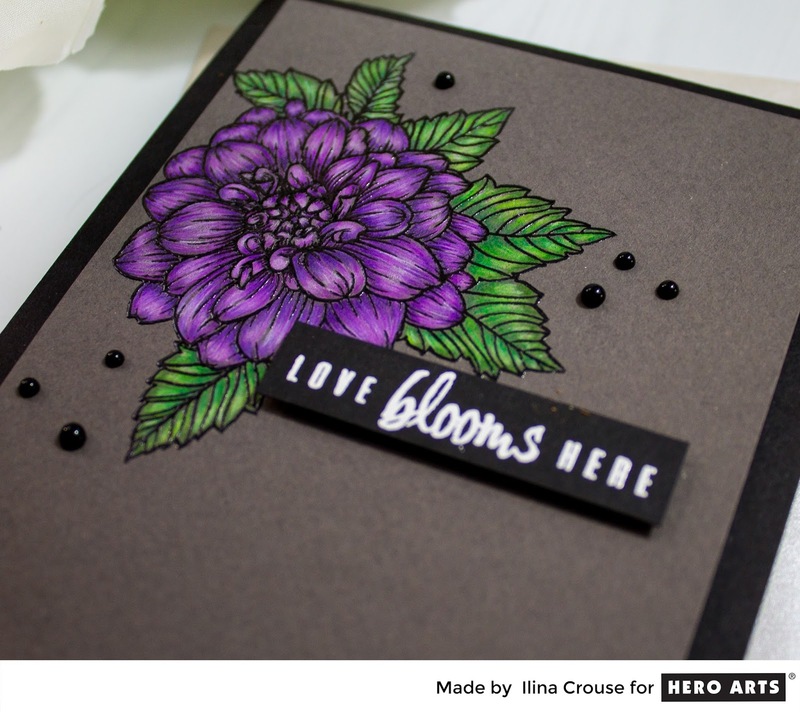 For my first card I used the new Dahlia stamp and cut. 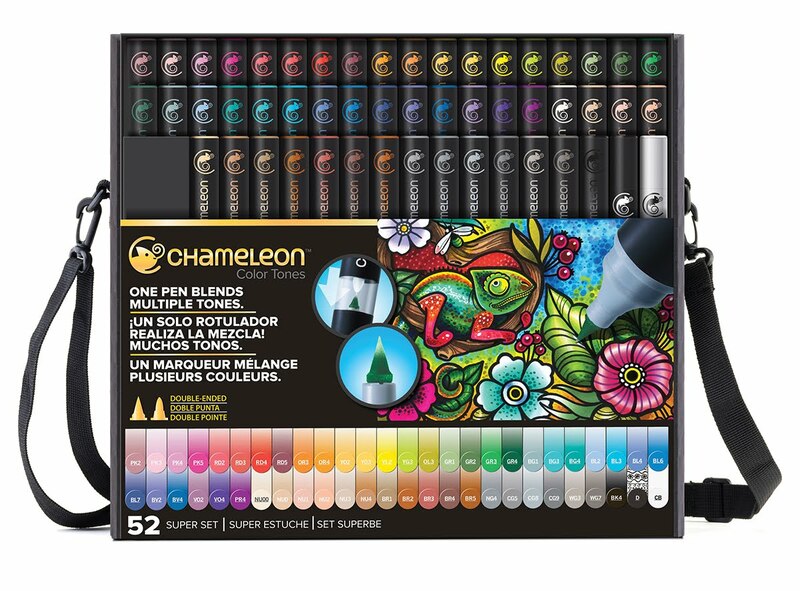 I stamped onto Canson Mi Tientes paper and colored with Chameleon Pencils. 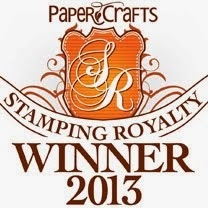 Then overstamped again with black ink and embossed with ultra fine embossing powder. I stamped the sentiment onto black paper and embossed with white. I assembled the card and adhered onto black note card. 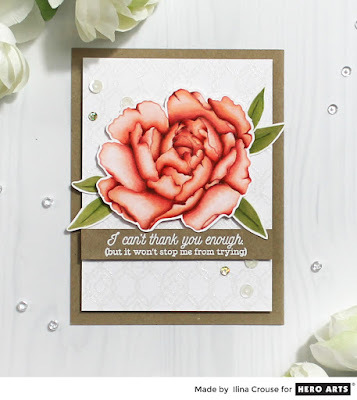 For this card I used the Artistic Peony and did some no line coloring using Copic markers and Prismacolor pencils. I stamped the background and embossed with Sparkle embossing powder. For the sentiment I used White Embossing powder. I assembled my card onto Kraft note card. Next I used Blossoms for coloring set and bold prints. For the background I stamped it with Versamark and embossed with white. Next I stamped the flowers and colored with copics. I cut them out very close to the edge. I die cut Hello 3 times and adhered the die cuts together. I stamped "beautiful" on the circle vellum piece and embossed with white. I assembled the card onto black note card. Last, but not the least it;s a card using the new Llama stamp and cut. I stamped the images and background onto Bristol paper and colored with Hero Arts liquid watercolors. Cut out the Llamas and assembled the card onto black note card. 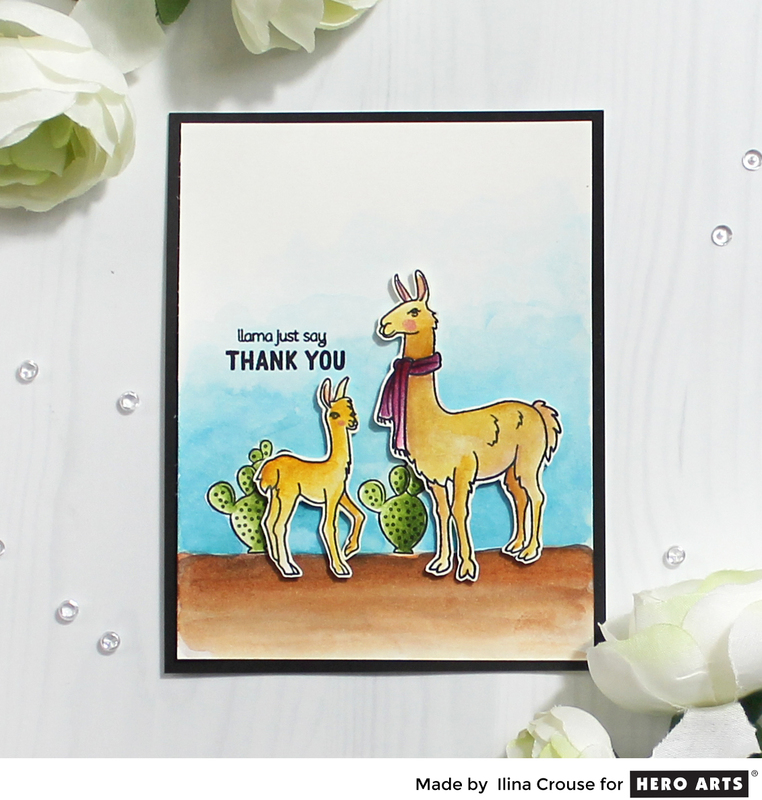 Loving all your floral designs and of course, the llamas! I love the purple on gray!! Lovely cards! I like the background on the peony card very much. Thanks! I really love your cards today! I especially love the one with the black base and white embossing for the background... Very striking! Your floral cards are so gorgeous! I especially love the black backgrounds. They really make the colors pop. 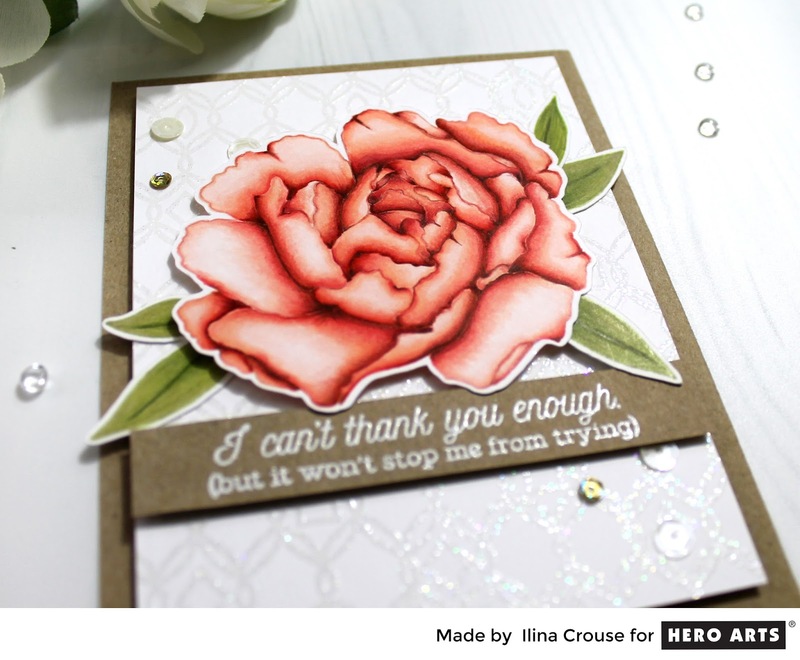 Stunning array of cards, Ilina. I love the intense purple flower (I have some in my garden and they are just WOW!). Love the B&W background with the colorful flowers. That is simply stunning! I love seeing your art, always. Oh my! The color on the first two flowers (purple and peach) are splendid and vibrant! Those llamas are the cutest! I love all your cards! My favorite is the third with the black and white background and bold colored flowers. 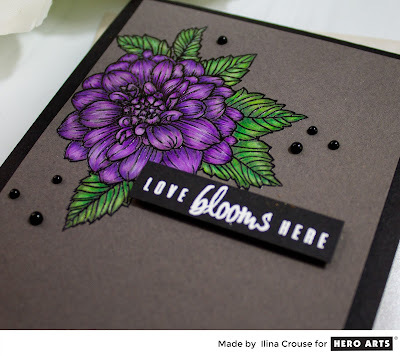 I love your card featuring the Blossoms stamp set & background stamp. These are my faves in this release!-Maria Giselle B. Really amazing designs! I love your variety and the colors and embellishments you chose! I love the purple flower. I am definitely going to purchase the peony stamp & die! Love all, but the ones on dark card are really striking. Beautiful cards and I love them all. The purple Dahlia on the black is so stunning and the Artistic Peony is gorgeous as well as the adorable scene with the alpacas! Great job. All these cards are masterpieces!! I love how you colored the dahlia, and the subtle background for the peony? Gorgeous!! Geez, so much to look at. I never think to stamp and color on dark paper. I think I will try that tonight! Your use of dark color card stock for the background is inspiring! Beautiful! Really love the floral cards. 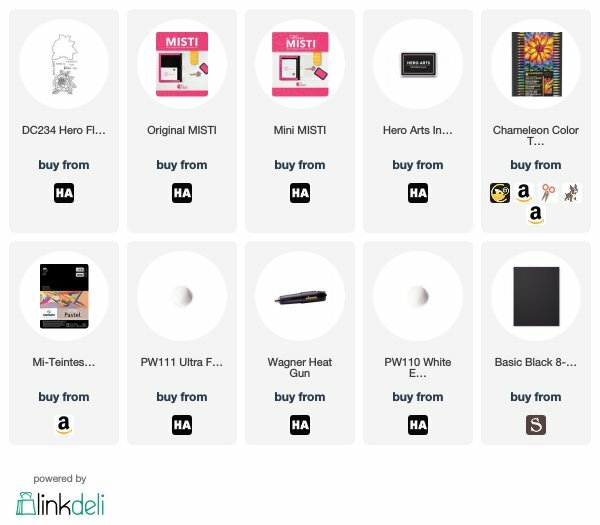 Love these products! Fantastic cards Ilina. Love the coloring on the pretty flowers... fantastic backgrounds! Oh, those llamas are so cute! Great water coloring! Great ideas on cards and the colors are great!Awesome set of cards!! From elegant to cute, you created some special cards. Wow, these ones are incredibly beautiful ! 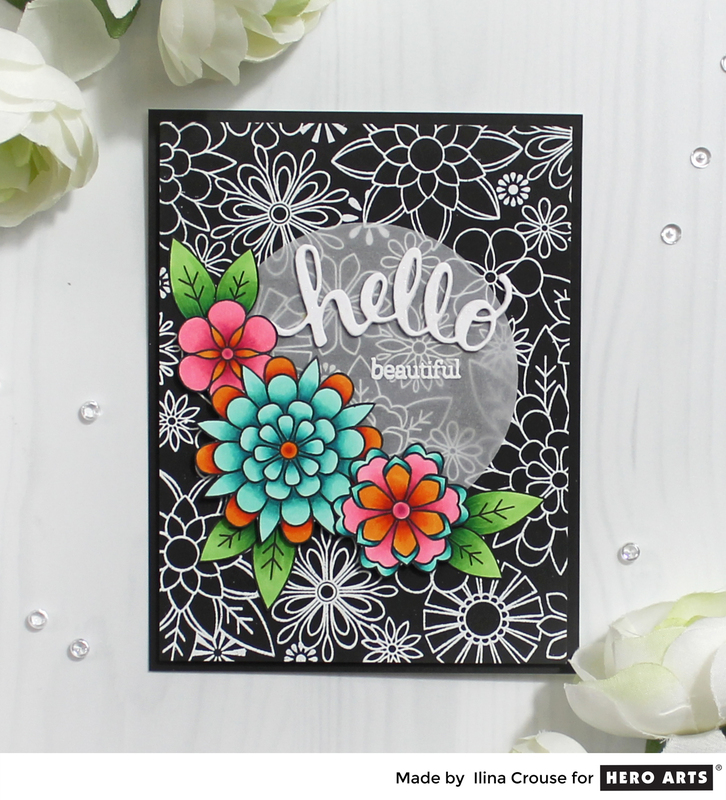 Your colours are bright and vibrant and your colouring is perfect to add beauty to these already fantastic stamps ! ALL of your cards of spectacular! My favorite is the artistic peony card. Your coloring is beautiful. Thank you for sharing your creativity. Such beautiful floral cards! So CAS and elegant! Your cards are just wonderful. The florals are elegant and beautiful, both in design and strength of the color you chose. The llama card is darling. 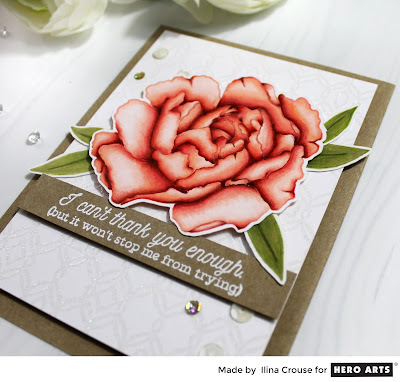 I found your blog through the blog hop and wow - what wonderful cards! 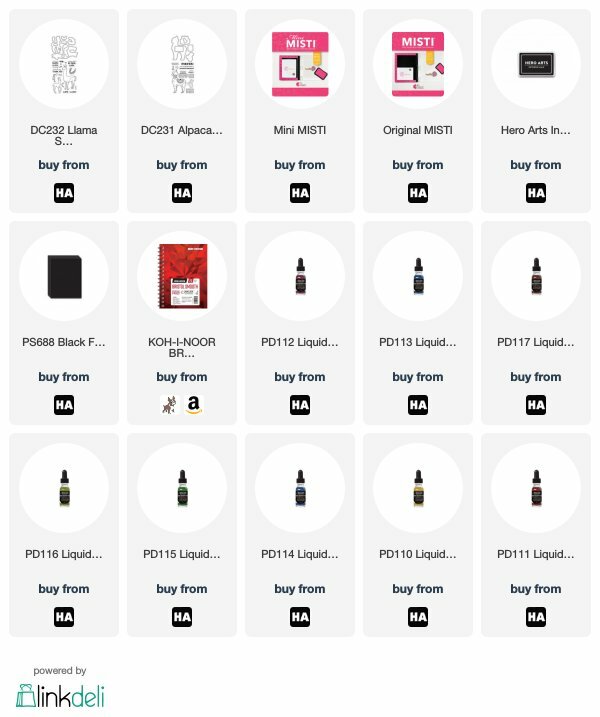 I'm loving this entire new release line from Hero Arts. Wow love the vibrancy of your florals th recipient will love these. Wow! your florals are amazing! Gorgeous cards. Love the dahlia! Your florals are stunning. Thank you for sharing. Love the use of embossing and die cuts . The llama/alpaca sentiments tickle my funny bone. WOW... beautiful set of cards, each one with wonderful colors, designs, and so perfectly done. 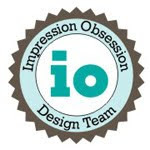 TFS so much inspiration with your work showcasing these terrific new release products. 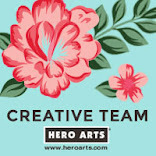 I love Hero Art's new florals...they're so realistic. Your coloring is striking. Gorgeous cards. OH! What inspiring examples. Thank you so much. Stunning cards! You achieved so much depth and richness from your coloring. Love these cards! The new HA release is fabulous. I like the vibrant colors on your floral cards and the cute llamas. 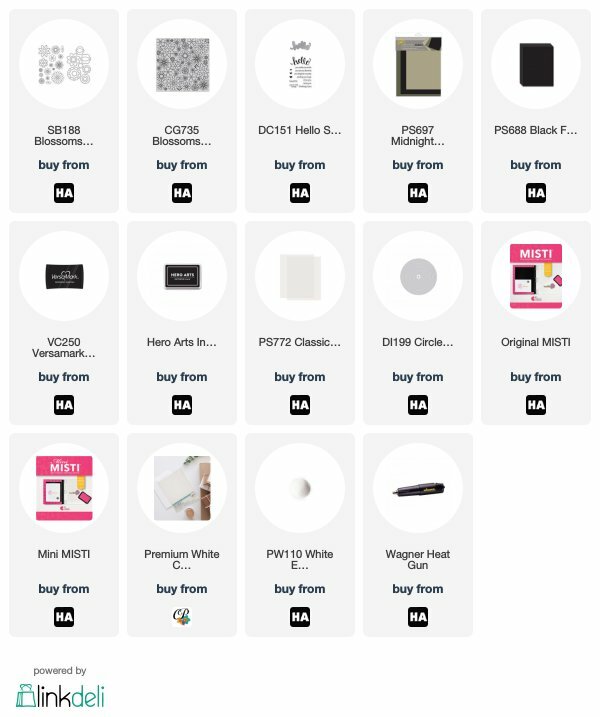 These are all gorgeous, but I have to say, the black and white is a standout! Great work. Your coloring is so beautiful! Your cards just blew me away. Thank you for being so inspiring. So pretty! I especially love your last card! Absolutely stunning cards!!! Love the bold colors! 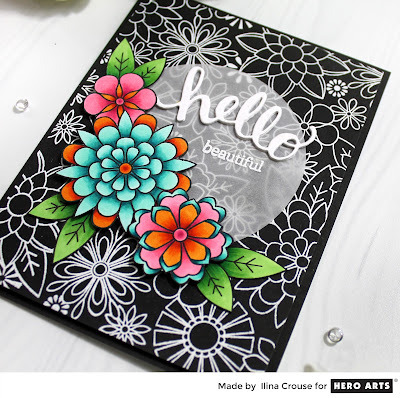 Love the floral card...coloring is amazing! Love all these ideas, but the bold blossoms are my favorite. Love it how it stands out. Absolutely beautiful cards. Your coloring is amazing. I also love the white background embossed on black. The floral cards are just lovely and the llamas so cute!! 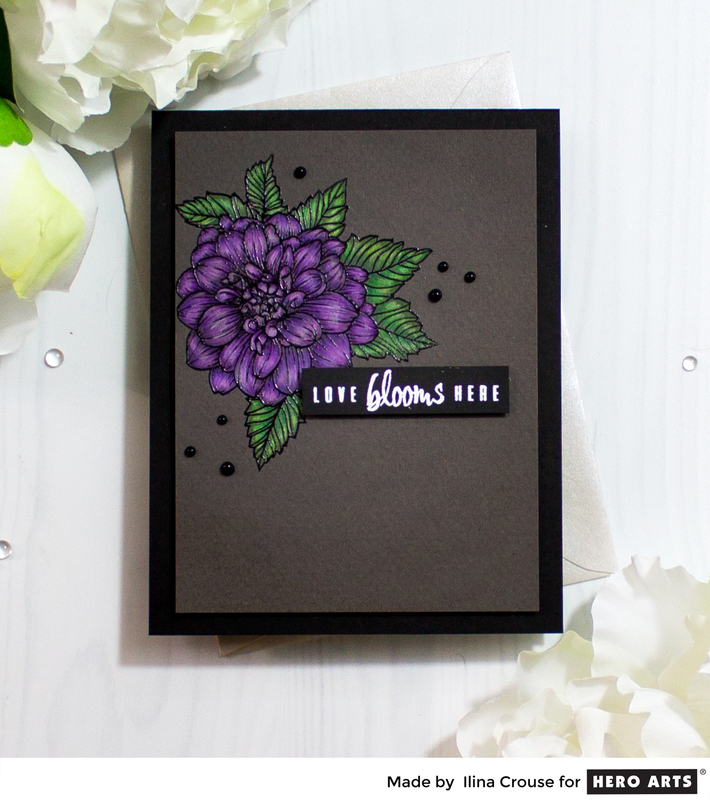 Really love that sentiment "Love blooms here"
All of your cards are amazing but your no line coloring peony is just stunning!!! So gorgeous!!! Amazing cards and my favorite is the artistic peony! Beautiful coloring on these stunning cards. Each is a treasure! Oh, you've been busy. This is a wonderful release & you've showcased it so very well! I love the colours on the peony card & the elegant simplicity of it. At the same time I also love the last card. It's got so much more to look at, yet it doesn't appear overcrowded. All are fantastic! Love the gorgeous blooms against the dark backgrounds! All your cards are so beautiful Ilina!! And very inspiring indeed! BEAUTIFUL cards! Your 2 Peony floral cards are absolutely vibrant! So colorful!!! Love that bold purple flower against the darker paper....not something I see very often, but I really like it! Your peony coloring is gorgeous! And that last card is my fave! 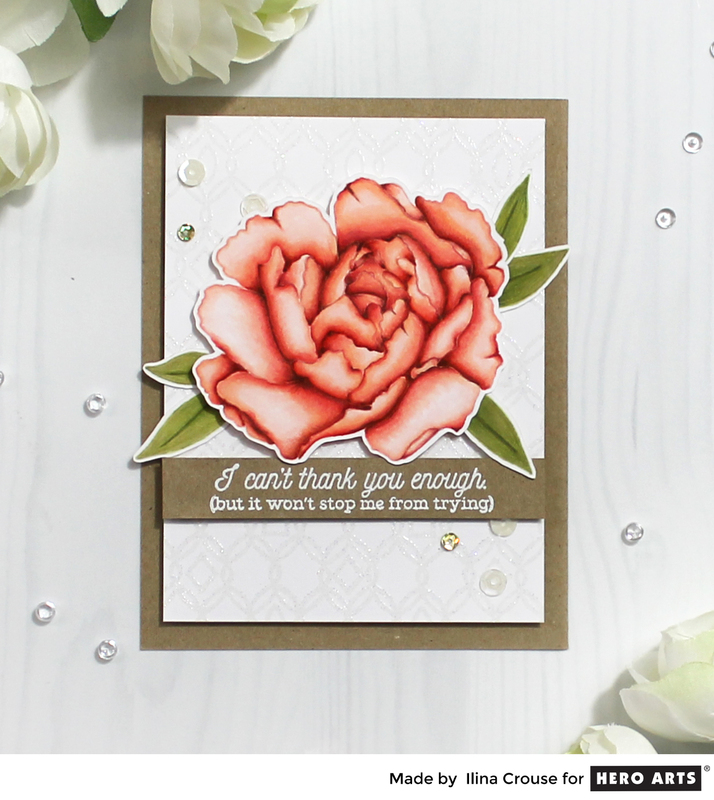 The white embossing, bright florals, and the bit of vellum are just beautiful together. Thanks for your inspiration! I love the pencil work on the dark cardstock. The Llama's are too sweet. Great job with your layout and coloring. Such gorgeous cards. Love the peonies. All of the cards are so different. Thanks for the inspiration. Such pretty cards! Love the llamas! All of your cards are so lovely! wow, gorgeous cards!! love them! These cards are so rich with colour. Wow! 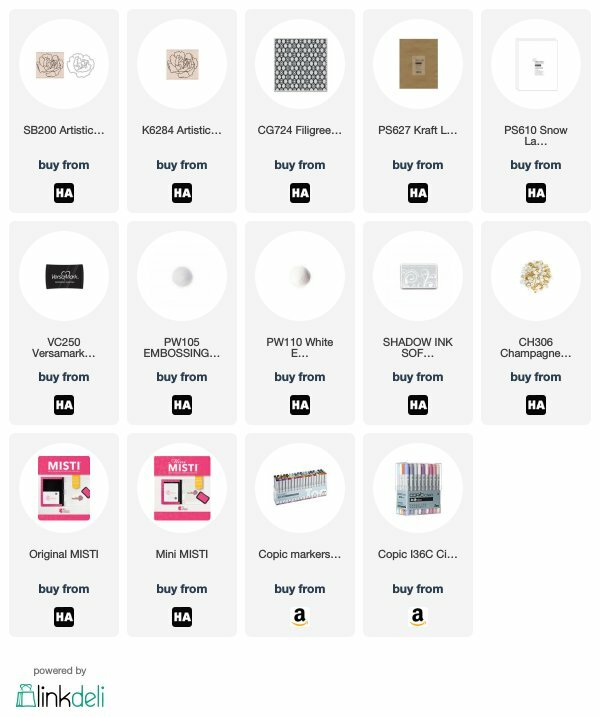 Your cards and colors are simply gorgeous!!! The llama card is so darn cute. The colors on these cards are just gorgeous! I wish I could pick colors like this. The flowers are gorgeous and the llama card is sweet. Your cards are awesome, the colors really pop. Your cards are really awesome!love the colors. Thanks for the chance to win. What a beautiful collection of cards and techniques! I'm glad to see someone using Canson Mi-Teintes, because I happen to have some and was considering using it to color on, and now I know I can. All of your florals are gorgeous, and I look forward to playing around with some of your ideas! Thanks for sharing with us. Ilina, your coloring is wonderful! Beautiful cards! Wowzer... do many cards! I love your color combos on all the flower cards! That peony is huge! Adorable alpaca card! I am loving the new flowers. You colored these so beautifully. Great cards. Thanks for sharing your creativity. Lovely cards, such a variety of styles. 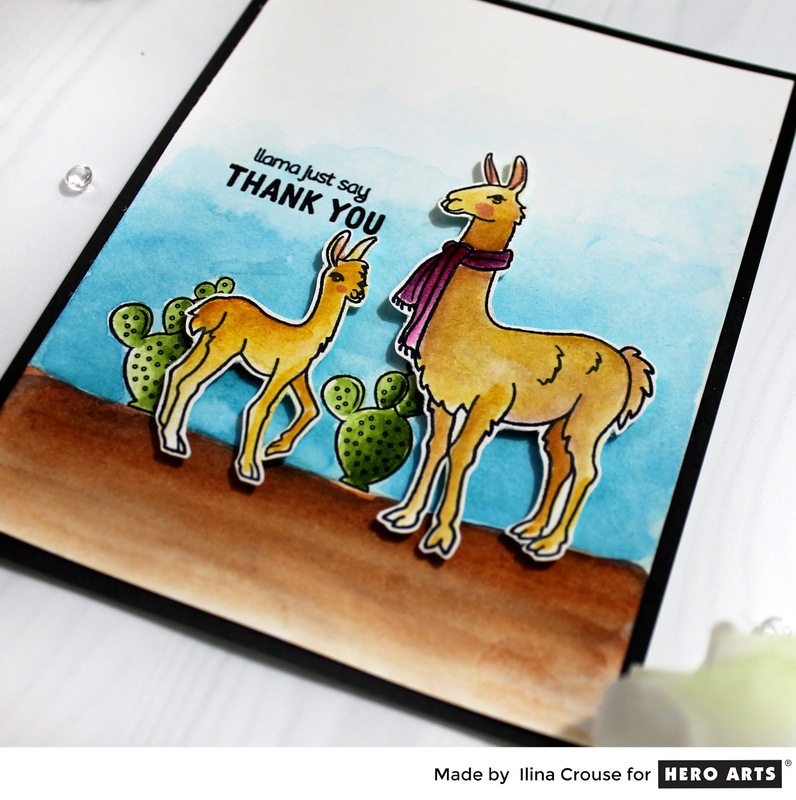 Absolutely STUNNING cards Ilina, your llama card is adorable as well. Your florals are just breathtaking! Such beautiful and striking cards! Really enjoyed your designs! Especially the Hello card! Thanks for sharing! Oh my, the floral cards are simply gorgeous but that cute lama Mama--cuteness crazy! Wow !! That’s such a wonderful set of cards ! The floral with the black background is my favourite. Wow! I love all the floral cards! They are gorgeous! Thanks for reminding me about re-stamping and embossing on top of colored pencil coloring. I keep forgetting about that! I really enjoyed seeing your cards. The floral cards are stunning. Thanks for sharing. The flower cards look great. I especially love how you colored the peony, just beautiful. I also love the white on black background of the last card. Great cards - love the pretty florals and the llamas are adorable ! Your florals are phenomenal! 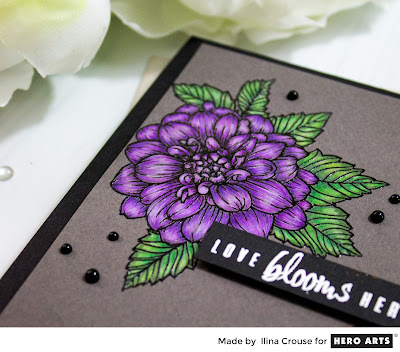 The purple one is stunning on the dark background and the Artistic Peony looks so real! Fabulous cards. Really love those gorgeous florals.